AYPC Services – Page 8 – All about Tech! Pivot Tables are an amazing built-in reporting tool in Excel. While typically used to summarize data with totals, you can also use them to calculate the percentage of change between values. Even better: It is simple to do. You could use this technique to do all kinds of things—pretty much anywhere you’d like to see how one value compares to another. In this article, we’re going to use the straightforward example of calculating and displaying the percent by which the total sales value changes month by month. Here’s the sheet we’re going to use. It’s a pretty typical example of a sales sheet that shows the order date, customer name, sales rep, total sales value, and a few other things. To do all this, we’re first going to format our range of values as a table in Excel and we’re then going to create a Pivot Table to make and display our percentage change calculations. If your data range is not already formatted as a table, we’d encourage you to do so. Data stored in tables have multiple benefits over data in cell ranges of a worksheet, especially when using PivotTables (read more about the benefits of using tables). To format a range as a table, select the range of cells and click Insert > Table. The Geary email client has a new update available ready for download. Geary 3.32 adds in a ton of excellent features and promises to make your emailing experience much nicer on the Linux desktop. Geary 3.32 isn’t a massive release in terms of features. The developers haven’t chosen to re-invent the wheel. You won’t see the entire concept of Geary changing. Instead, the developers have introduced some useful, common-sense updates which are sure to make fans of the popular Linux email client eager to update. With Geary’s new update, they’ve chosen to add in more tight integrations to the Gnome desktop, such as sticking to the release cycle of Gnome Shell every six months. They’ve also tightly integrated it into Gnome Contacts so that Geary can now grab contact information from the Gnome contacts system, rather than having to use a built-in one. Additionally, they’ve improved email server detection, introduced a compact settings menu, added in a cleaner new desktop icon, and even given users the ability to customize the look of the composer window with CSS code. The 3.32 release of the Geary email client introduced some new and exciting things, and we covered that earlier. However, it also introduced a different program distribution style. As of now, the developers of Geary will not be pushing out the latest 3.32 version through the standard packaging formats (DEB, RPM, etc.) Rather, updates will now be delivered through the Flatpak packaging system. The change means that if you have Geary 0.12 installed on your Ubuntu desktop, you won’t be able to run the update command, or click “Updates” in the Ubuntu Software Center for the latest version. Going with Flatpak might seem outlandish, given that a release of the Geary email client already exists inside of many Linux distribution’s software sources, but it’s understandable mainly because packaging apps for a large amount of Linux operating systems are cumbersome and takes a lot of time. Given that the new Geary email client is being distributed to users as a Flatpak package, it’s essential to go over how to get the Flatpak runtime working on Linux. Setting up the Flatpak runtime is getting easier, as more and more Linux distributions embrace it. Distributions like Fedora are starting to enable it by default! If you’d like to get Flatpak support working on your Linux operating system, open up a terminal window and install the “flatpak” package. Alternatively, open up Gnome Software, click the search button, type in “flatpak” and install it that way. Having issues getting the Flatpak system up and running? Check out our in-depth tutorial on Flatpak! It covers how to install and enable the software on nearly every distribution out there! Installing the latest release of the Geary email client via Flatpak involves subscribing your Linux PC to the Flathub application repository. To do this, you must open up a terminal window. Then, use the following command. Note: do not run this command with sudo or root! You may inadvertently subscribe the Root user, rather than your own! With the subscription installed, you should now be able to work with the apps on Flathub. From here, you’ll be able to install the new release of Geary using the following command. The Geary email application can also be installed through the Gnome Software application if the command-line isn’t your thing. To do it, ensure that you are subscribed to Flathub. Then, open the app store, click on the search icon, and type in “Geary” in the box. In the search results, click on Geary. Then, read the page and make sure that it says “Flathub” as a source. Then, find the “Install” button and click it to start the installation. Once Geary is installed, launch it through Gnome Software by clicking on the “Launch” button. As stated earlier, it’s critical you get the Geary application through Flatpak, as the developers can quickly deliver updates this way. However, this isn’t the only way to get access to the new update. In this section of the guide, we’ll go over the other, non-Flatpak ways to enjoy the new Geary release. Unsurprisingly, the Arch Linux people have already taken the new 3.32 release of Geary and put it up in their “Community” software repository. If you’re on Arch and don’t want to use the Flatpak release, here’s how to install it. Start by opening up the /etc/pacman.conf file in Nano. Scroll through the configuration file, locate “#Community” and remove the # symbol from in front of it. Do the same for the lines directly underneath as well. After you’re done editing, save the file with Ctrl + O and exit with Ctrl + X. Then, re-sync Pacman. The source code for the new release of Geary is free to download and compile. While there are no direct instructions on the website, there is information in the release file itself. To download the source code, open up a terminal window and use the wget command. Move into the code folder with the CD command. Take a look at the “README” file to learn how to compile and install the new version of Geary! install is a versatile file-copying command in Linux and macOS. It’s perfect for the power-user looking for efficiency. Read this article to discover how to work smarter—not harder. Wait—It’s Not For Installing Software? The install command might have the most misleading name of any of the Linux commands. It doesn’t actually install any software. 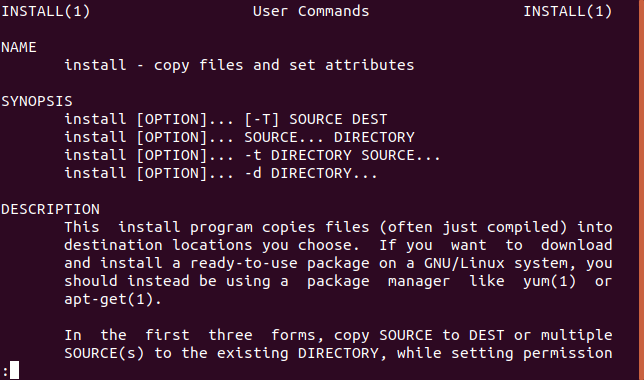 If you’re trying to install a software package from the command line in Ubuntu or another Debian-based distribution use the apt-get command. On other Linux distributions, use your Linux distribution’s package management tool instead—for example, dnf on Fedora or zypper on openSUSE. In a nutshell install combines elements from the cp (copy), chown (change owner), chmod (change mode), mkdir (make directory), and strip (strip symbols) commands. It lets you use functions from all of those in one single action. Copy files like the cp command. Choose whether to overwrite existing files. Create the target directory if it does not exist, like mkdir. Set the user permission flags of the files, just like the chmod command. Set the owner of the files, just like the chown command. Remove non-essential baggage from executable files, just like the strip command. Despite all that functionality, the install command doesn’t have too many options to contend with. The install command probably won’t be used every day. It’s useful, but only for certain situations. One scenario where install comes into its own is software development. Let’s say you’re programming a new utility. You’ll need to do testing outside of the development environment. To do that you need to copy the new program files to a test directory. The test directory might need to be created, and you need to set the correct permissions and ownership for the files. Because development is an iterative activity, you can end up doing this sequence of actions many, many times. The install command does all the heavy lifting for you. Finally, when your new utility is ready to be deployed, you can use install to copy it with the correct permissions to its final working location.